Boyhood is a very special movie for audiences. Not only because it’s taken a unique and unmatched approach to its storytelling (except for maybe Michael Winterbottom’s Everyday), not only because it grounds its situations and characters so firmly in reality that you could swear you’ve experienced them yourself, and not even because director Richard Linklater, he of Dazed and Confused and Before Sunrise/Sunset/Midnight glory, is the one behind it all. No, the reason that this movie rings true for everyone is because, simply, it IS everyone. Linklater has taken the trials and tribulations of growing up and transplanted them into a film that mirrors a part of each and every person. Someone, at some point in their childhoods, has quarrelled with their older siblings – in this case, Mason Jr (Ellar Coltrane) against elder sister Samantha (Lorelei Linklater) – gone camping with their father as Mason Jr does with Mason Sr (Ethan Hawke), and discovered young love with another person. These, as well as countless others, are rites of passage we have to manoeuvre through as part of early life, and Boyhood is one of the rare examples where they have felt entirely real. Not constructed or compromised, REAL. Though the story and characters are indeed fictional, from an original screenplay also by Linklater, you feel like you either knew these people or at some point were these people. Whether you’re the wide-eyed dreamer, the moody teenager, the intellectual know-it-all or just curious about the world around you, there’s someone in this movie to identify with. Helping the strong connection between audience and screen is, of course, the film’s major selling point: the young actors never change throughout the twelve-year shooting schedule, and they literally grow up before your eyes. Coltrane, as the central figure of the entire piece, is a very naturalistic performer, so much so that you wonder if Linklater ever bothered to shout “action” during many of his scenes. To see him transform from a young boy staring up at the world all the way up to a young, beard-sprouting college student is pure movie magic; helped by the very subtle transitions courtesy of editor Sandra Adair, it’s fascinating to see him become older with every passing moment, even when you don’t know it’s happening. It isn’t just Coltrane changing, however; over time, his divorced parents go through their own obstacles, including Hawke’s maturing from a deadbeat musician to a minivan-driving family man, and mother Patricia Arquette’s unsteady managing of work, abusive marriages and acting as mother to her sprouting children. As with their on-screen son and daughter, Hawke and Arquette grow up and work on their own personal paths, either for better or worse. Both do excellent work conveying the struggles of adult life and being parents while also taking responsibility for their families and own self-worth. The movie also works as a great time capsule, from the year 2002 onwards. Because of the lengthy shooting pattern, tidbits of pop culture from every year are contained and brought up in conversation or shown to our ever-pleasing nostalgia. In 2002, Mason Jr watches DragonBall Z while his sister sings Britney Spears songs; in 2008, he helps his sister put up signs of support for Barack Obama while having an intense discussion with Hawke about why they’ll never make another Star Wars movie (which of course got a huge laugh in this screening); a few years later, he’s Skyping with Hawke on his iPhone, and so on. It’s these moments that most young people probably grew up with, and seeing them so lovingly depicted on-screen as though it was made there and then (and in this case, it was) is a joyous occasion to make the child in you scream with nostalgic delight. This movie deserves to be seen by anyone who had a childhood – so, that’s nearly everyone, then. Funny, sad, poetic, nostalgic, how can anyone not find this all enthralling? 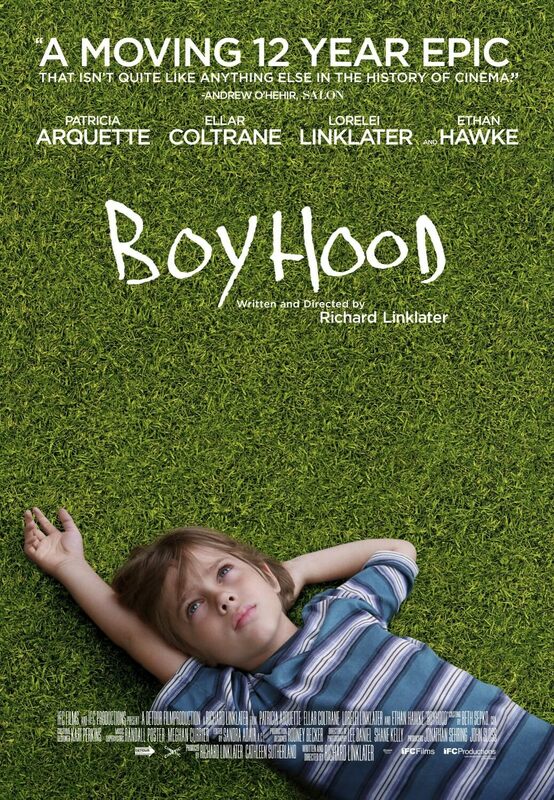 Simply put: Richard Linklater’s Boyhood is not just his, it’s all of ours. 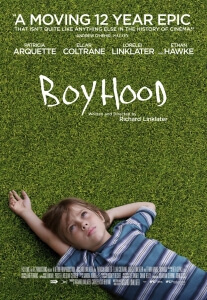 Boyhood is an incredible portrait of growing up, with masterful dedication by director Richard Linklater who guides us through the tough moments but never lets us forget the moments of joy we all experienced at many points in our lives. Make sure you see it at the first opportunity; there’s no knowing when we’ll get another film like it.